-Knee joint is formed by the thigh bone (Femur) and shin bone (tibia). 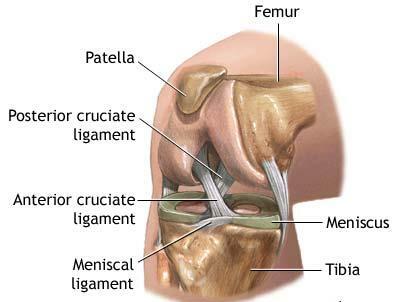 -Knee cap (Patella) lies in front of the knee joint. 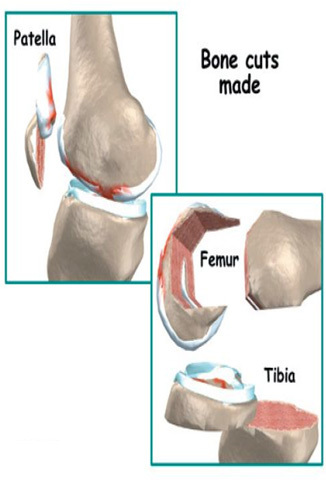 -Knee joint is lined by tissue called Synovium which secretes fluid called Synovial fluid. It aids in lubrication of joint. -The ends of thigh bone and shin bone are covered by Cartilage which provides a cushion for smooth movement of knee joint. -Joint capsule and ligaments around the knee joint provide stability and strength. 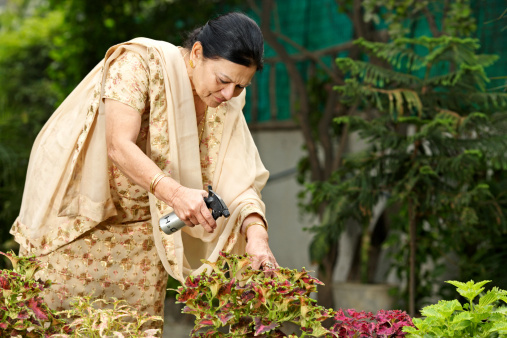 -Ageing: a result of natural wear and tear which is termed as Osteoarthritis of knee. -Injury / fractures around knee joint. 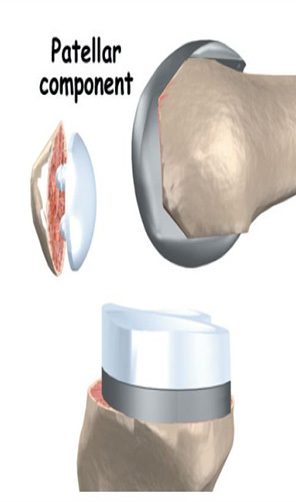 -In some individuals genetic factors may also predispose to early damage to cartilage. 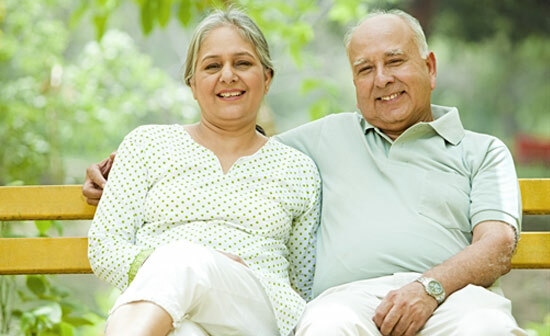 How will Total Knee replacement help you? You will be asked to undergo complete health check up. They will help you to identify the conditions that would interfere with your knee surgery. Cardiologist will evaluate you by checking blood pressure, getting ECG and 2D echo. He may order special tests like Dobutamine stress echo or Stress thalium if necessary to know the status of heart. Lab tests include Blood, urine and cardiac tests. Surgeon examines your knee prior to the surgery. There should be no skin infection, wounds around the knee and skin should be clean. 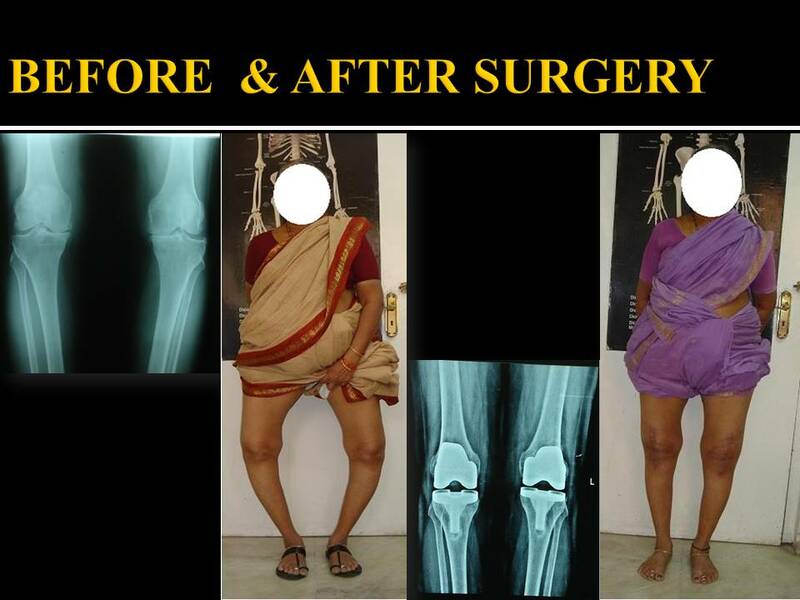 You should be in good general condition prior to planned date of surgery. There should not be any fever, generalized weakness etc.You should inform doctor about any blood thinning drugs like Ecospirin, Clopidrogrel if any prior so that you will be advised to stop them at least week before the surgery. You should also inform about any procedures on tooth, urinary tract, eyes that are scheduled during perioperative period. After getting all the blood tests and cardiologist opinion you will be examined by anaesthetist. 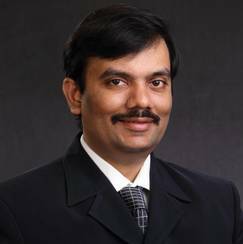 He will evaluate you and gives you fitness for giving anaesthesia and advices different modalities of pain relief during postoperative period. -You will be admitted in the hospital or asked to come directly to the hospital on the planned day of surgery. -You need to take the medications for you blood pressure and diabetes. -You should have light dinner without much oil and spices and plenty of water. You should start fasting from 11PM on the day before surgery till further advice. -You should give consent and sign an informed consent. -Follow you anaesthetist and surgeons orders if any given to you in writing.-Have a neat shower. -You should be on fasting, take your regular blood pressure and thyroid medications if any with sips of water at around 6 AM. -Limb to be operated will be marked by the surgeon. -You will be shifted to operation theater half hour prior to surgery. -Anaesthetist will evaluate once again and prepares you for giving you anaesthesia. 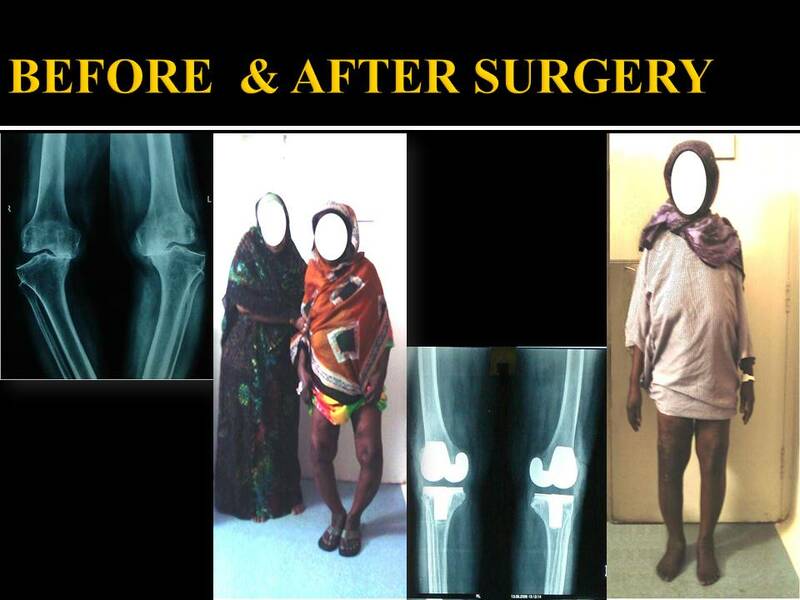 Most of the knee replacement surgeries are carried under spinal anaesthesia. In rare cases when a patient is not fit for spinal anaesthesia, Knee replacement is performed under general anaestheisa. Postoperative pain relief is achieved by continuous Lumbar epidural pump or continues Femoral block pump. 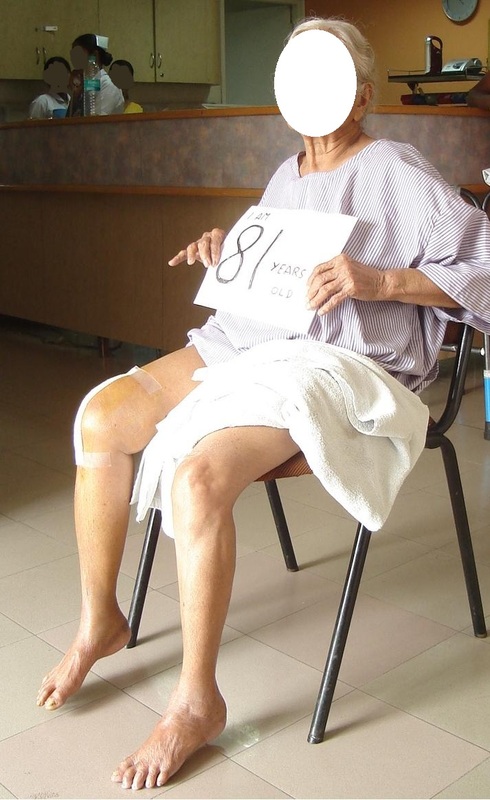 It is a surgical procedure in which the damaged lining of the knee joint is replaced with metallic lining and plastic cushion to aid smooth movement. 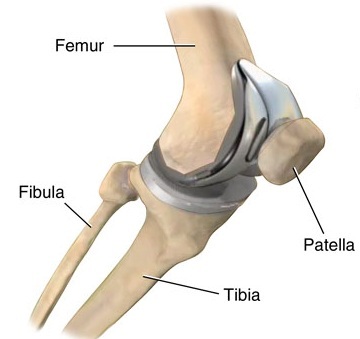 -The damaged cartilage and bone of lower end of thigh bone (Femur) is replaced by similarly shaped metal shell. 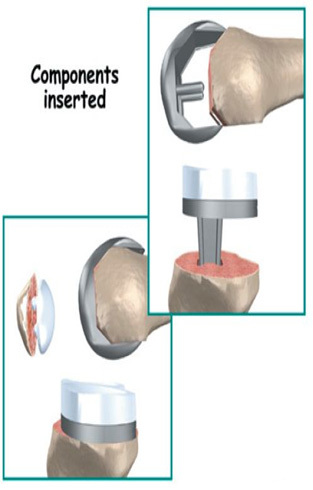 - Similarly damaged cartilage and bone of upper end of shin bone (Tibia) is replaced by metal plate with plastic cushion. -These metallic surfaces are fixed to bones with the help of bone cement. -In some conditions when the lining of the knee cap is also damaged it may also be replaced with plastic button. -Immediately after knee surgery you would be shifted to ICU (intensive care unit) and observed for at least for 24 hours. -After a day you will be shifted to ward of your choice. -On the bed you are advised to perform deep breathing exercises. -Ankle pump and static quadriceps exercises on the bed. -Gentle mobilization on bed with legs hanging down the bed and knee movement exercises. -If you are strong enough you would be made to stand and even walk with the help of walker. -You will be shifted to ward. -To continue the exercises on bed and walking with help of walker. 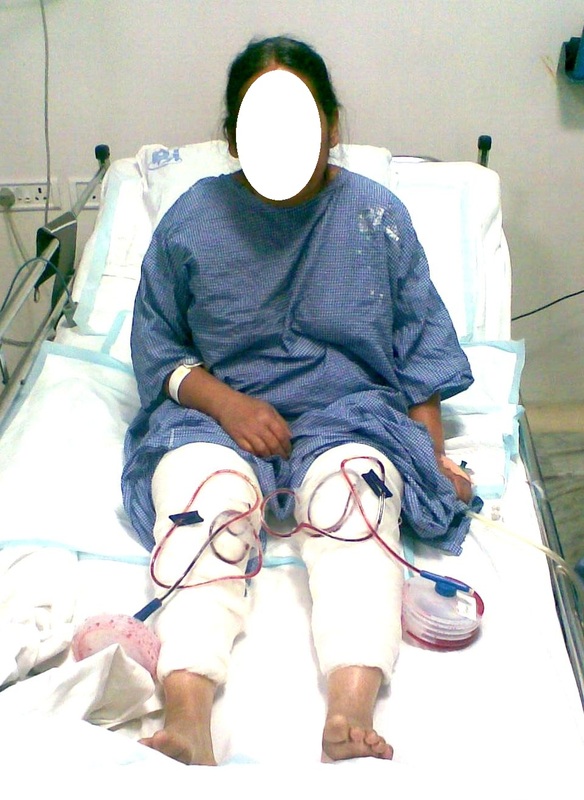 -Drain tubes urinary catheter will be removed on the second day. -You need to take plenty of fluids and regular diet. -Depending on speed of your recovery discharge would be planned. -The bulky dressing on the knee is changed to simple dressing. -You are advised to continue exercises and walking, gradually increasing the pace. -Some patients with slow recovery are discharged on 4th postoperative day. -Getting in and out of the bed independently. -A good progress in bending your knee or to achieve approximately 90 degrees. -Walking with the help of walker and climbing up and down the stairs. You should continue to stay active when you are at home for full recovery. However remember not to overdo it. You will observe gradual improvement and increased endurance over the next 6 to 12 months. You will be able to walk on crutches or a walker soon after surgery. But you will need help for many weeks with tasks like cooking, shopping, bathing and doing laundry. Make advance arrangements to have someone assist at home. Before going for surgery, follow the steps given below to make your recovery at home easier. -Fix safety bars in your shower or bathroom. -Secure your stairways for support and safety. -Keep a stable chair, for your early recovery period, with firm cushion, firm back, two arm, and footstool for leg elevation. -If you have low toilet seat, fix a seat raiser with arms. -Walking up or down the stairs within you pain limits and depending on your recovery. -Keep the wound area clean. -If your wound appears red or begins to drain, inform your doctor. -If you observe swelling, elevate your leg slightly with support and apply ice- packs over the swelling intermittently. -Inform your doctor immediately if you have calf pain, chest pain, or shortness of breath. -Practice / initiate regular walking using crutches or walker. -Perform exercises to strengthen calf and thigh muscles. -Do not play high impact sports. -Do not jog, run or jump. -Avoid gaining weight as it can hasten wear and tear of the implant. -Do not shower or bath until the sutures are removed. -Continue to exercise as instructed by your physiotherapist or doctor for at least 2 months after surgery. 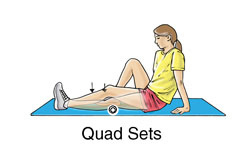 1.Static quadriceps: Sit with your legs straight and keep a rolled towel under your knee. Press the knee against the towel while tightening the thigh muscles. Hold this for a count of 5 to 10. 2.Heel slides: Sit or lie on your back and gradually bend your knee by sliding the heel on the bed. 3.Knee straightening exercises: place a small rolled towel just above your heel. Tighten your thigh. Try to fully straighten your knee such that the back of your knee touches the bed. Hold for 5 to 10 seconds. 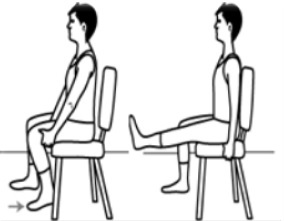 4.Knee bending: Sit on your bed side or chair with your thigh supported. Gradually allow your leg to fall down gently on its own weight. Now gently try to push your leg backwards till the back of the leg touches the chair or cot edge. Hold your knee in this position for 5 to 10 second. 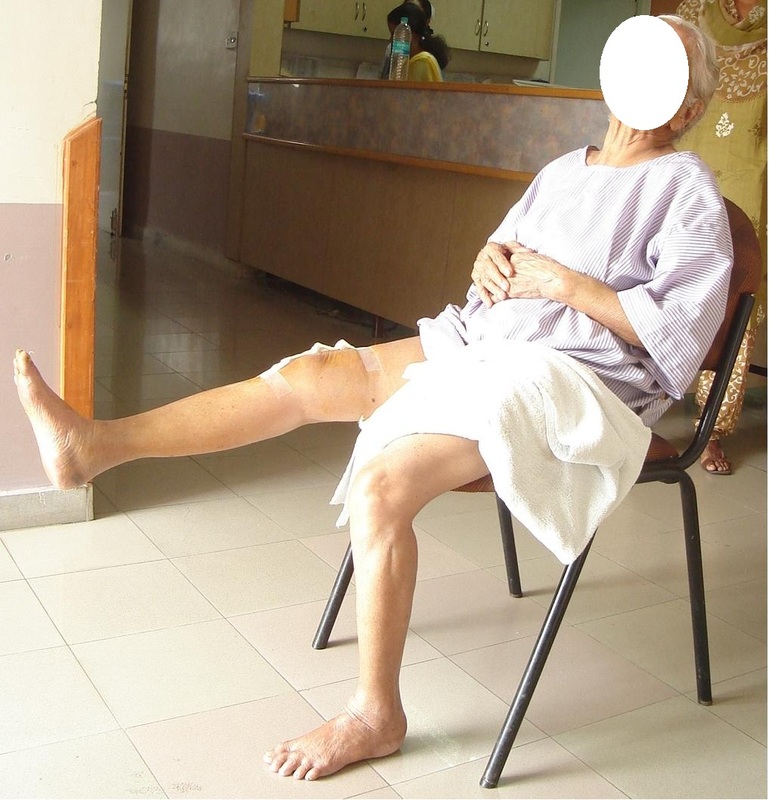 Gradually try to lift the leg upwards initially with support of other leg or physiotherapist. When the leg becomes straight maintain it for 5 to 10 seconds. 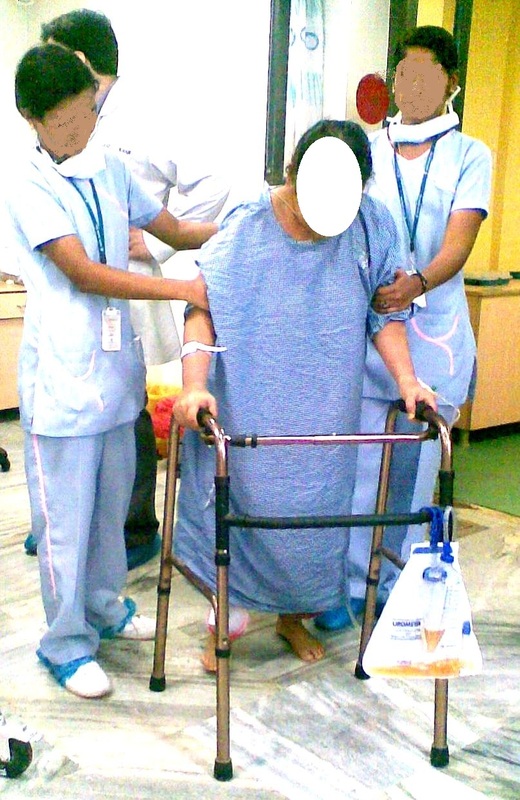 5.Weight bearing: Full weight bearing on the operated leg with help of walker for initial 4 to 6 weeks. Single elbow crutch walking next 3 to 4 weeks with crutch on the operated side. Independent walking without any aid can be started depending on the patient’s recovery and confidence 4 weeks after surgery. -While you are recovering in the hospital you will begin to eat normal diet. -Your doctors may recommend you to take iron and vitamin supplements. -Try to avoid alcohol and smoking. -Try to maintain ideal weight and weight conscious to avoid putting more stress on the replaced joint. 1.Driving: avoid driving till you recover fully. Avoid driving at least for 6 to 8 weeks. The reason behind that is that your reflexes may not be as brisk as those before surgery. 2.Metal detectors: It is better to carry a medical alert card or doctors certificate indicating that your joint is replaced with metal prosthesis. 3.Sleeping positions: you can safely sleep on your back, on either side or on your stomach. 4.Return to work: depending on the type of activities you perform, it may be 6 to 8 weeks before return to work. 5.Other activities: Avoid activities that put stress on the knee. These activities including playing tennis, badminton, football, baseball, jumping, squats, skiing and jogging. Do not lift anything heavy. -You should continue taking prescribed medications. -Antibiotics to be taken during and after surgery for a period of 5-7 days to week to prevent infection. -Pain medications during recovery and post-operative period will help you to control pain and aid to do physiotherapy comfortably. -Blood thinning drugs: Following major surgeries in lower limbs, patients are prone to develop blood clots in the veins. This condition is called as DEEP VEIN THROMBOSIS. These clots can dislodge and can reach lungs resulting thromboembolism which is a life threatening condition. Hence doctors prescribe Blood thinning drugs called anticoagulation medications. These drugs should be taken for a period of 2 to 4 weeks post-surgery. -Continue your hypertensive and diabetic medications as advised by physician. 1.Redness and warmth around surgical site. 2.Abnormal pain at the surgical site and knee joint. 3.Swelling of the knee joint. 4.All of the complaints with associated fever.